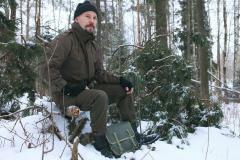 Austrian Bundesheer Gore-Tex (or Sympatex!) jacket. 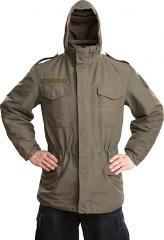 Cut very much like the US M65 field jacket, but is water- and windproof. 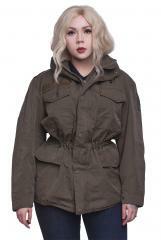 An excellent fall/winter jacket with practical features and nice nonchalant colour scheme. Generous cut widthwise: if you're between two sizes and want the coat for casual use, the smaller might be better. Zipper & snap closure, four front pockets with snap closure, a stow-away hood and generous cut, these are meant as the top layer. The membrane is squeezed between two outer layers. Other than that, these don't have any lining whatsoever. However these are roomy; it's up to the user to dress accordingly. 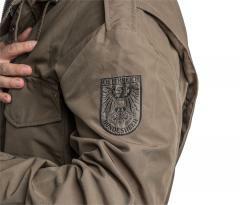 These usually have a velcro name tag base on the chest and Bundesheer logo on the arm, or traces of one. The composition of the outer fabric varies, it can be either 50/50% polycotton, 65/35% polycotton or 100% polyester. The membrane is either Gore-Tex or Sympatex, these are essentially the same. 100% polyester lining. First the easy size, then the user's recommended height and chest circumference in centimetres. These are a tad oversized to accommodate stuff underneath. 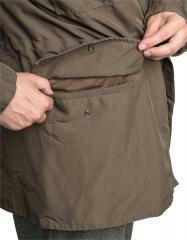 The Austrian size system is explained in detail on our Austrian jacket size chart page. If you are already familiar with Austrian sizing and want to know how we came up with the easy sizes, below is our logic as a chart. All possible sizes in the chart are not manufactured of course. In used but serviceable condition and repaired when necessary. Although we can't give any 105 % waterproofness guarantees in diving conditions for used membrane rainwear, these should do just fine. A very good Winter/Fall jacket, feels thick and nice, good Goretex membrane inside. Wrap the coat inside out through the hole, until you find a blue(ish) section: that is the part where the waist strap must be inserted. Insert the waist strap with a safety pin until you feel its inside the horizontal lining around the waist of the coat. Squeeze until you reach the other end of the jacket. That is where the waist strap must go through to get to the right side of the inside of the jacket. Then it's a quest to find the iron hole where the strap must go in, repeat on the other side. 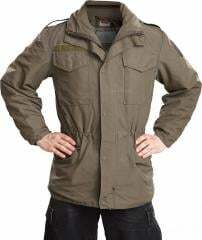 A very nice and sturdy Jacket. Mine was 50/50 polycotton and sympatex membrane. Very soft and silent fabric and apparently good breathing allthough I've only tried it in cold weather so far. Would truely be my favorite outdoor hunting/fishing/boating jacket in the years to come. Loistava (lysande) takki on tämä. Pitää tuulta ja sadetta sekä hengittää. Pikkupakkasilla riittää alle ruotsalainen armeijan poolopaita . Hihojen kiristys on nerokas eli sen voi tehdä hanskatkin käsissä aivan helposti. Edellisen vastaavan ostin vuosia sitten , kasvoin siitä ulos hartioiden osalta ja kun sen vetoketjukin jumittui , varmaan viiden vuoden käytön jälkeen, heivasin sen pois ja tilasin uuden.Tässä uudemmassa vain vasemman povarin vetoketju on jumittunut pysyvästi puolitiehen. varsinainen vetskari hieman jumitteli , mutta kun sen hinkkasin lämpökynttilän avulla muuttui toiminta täysin sujuvaksi. Vielä yksi hyvä juttu, kalvokerros on vuorin ja ulkokerroksen välissä joten se on hyvin suojattu. Kuin M65- takki , mutta paremmilla ominaisuuksilla. This is a great take on the M65 design, though with a couple of improvements. First off the waterproof Gore-tex is a great improvement, making this jacket a far more viable option in the rain than my original US 1980s M65. Secondly the hood in this version is also far better than the flimsy hood that is in the original M65 design, though it may not fold as flat as it is thicker and the collar style is slightly different. Other than those two main differences, and it being a little bit longer, this jacket is very similar to the classic M65 design. Mine arrived in very good condition with no stains or rips in the seams. The fabric is durable and the zippers and snaps all were in working order. It did appear that the sleeve snaps on one side closed a bit tighter than on the other, but this was not a big issue as it was just on the smallest snap, which I do not use. Overall I am very happy with this jacket and would recommend it for a friend. I have a new favorite rainy weather jacket! Mine came Gortex and brand new, with tags. Brilliant! Casual look and color for town, great fit, and of course would take you through a war or two if necessary. This is a jacket that will perform well in all but the extreme cold and look good doing it. It seems to breathe well for for a rain coat. For $50 it's a great piece of versatile gear for sure! 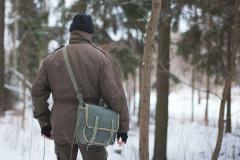 Before you order, ask the guys if the jackets they have in stock are the older M75/Kampfanzug 75 polycotton-only jackets, as I received that in the mail (made in 1983) and it does not have a waterproof membrane. I'd also reconsider this jacket if you're a fairly slim person; I ordered 88-92 I-II and the jacket runs large on me (especially the sleeves), even when layered on! This might be a better fit for more muscular or fatter people though, YMMV. Great jacket! Mine looks almost new. Always wanted one, and bought one a few days ago. Overestimated my masculinity, and ended up buying one that was a bit too big for me. Plan on giving bigger one to fat friend and buying smaller one for myself. Ostin takin tavallaan hetken mielijohteesta (lue: kerta toisensa jälkeen eri takkeja nettisivulla virtuaalisesti hypistellen) myymälässä maaliskuussa käydessäni, esillä oli small long-kokoinen takki mikä ihme ja kumma meni juuri ja juuri talvimahan kohdalta kiinni. Säätövaraa ei ollut vyötärönaruissa enää lainkaan, niin asiakaspäätteeltä pikaisesti tsekattuna askel kohti varastoa ja ystävällistä rättivääpeliä. Varastostahan löytyi medium long-kokoinen ja vieläpä hyväkuntoinen (lapussa on vuosiluku 1997, uskokaa tai älkää). Pikasovitus ja peilailemaan ryhdikkään miehekkäästi kokovartalopeilistä, ja eikun ostoskoriin. Kunnon testiin takki pääsi ensimmäisessä lopputalven vaakasuorassa räntäsateessa ja sehän piti vettä kuten pitikin. Pikkupakkasilla välikerroksena on ollut Särmän villaflanellipaita ja isommilla pakkasilla sveitsiläisten villapaita. Hemmetin hyvä takki eikä hintakaan ole paha. Luulenpa että vastaava merkkivaate merkkiliikkeestä kustantaa sen kolmenumeroisen summan eikä ensimmäinen luku välttis ole ykkönen.